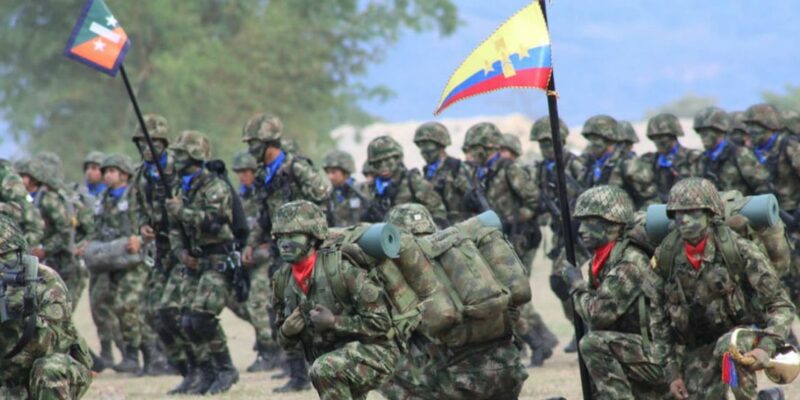 Colombia’s military is rapidly becoming a major cog in the United States wheel of global security strategy as the South Americans become more and more aligned with their US counterparts. The city of Cartagena will this week host a 12-day naval exercise off the country’s Caribbean coast involving the navies of eight Latin American countries, plus the US, Canada and the United Kingdom. This year’s version of the long-running naval war games is notable because it showcases the emergence of Colombia as a significant component of the United States’ global security strategy. It’s well-known the US has for twenty years supplied Colombia’s security forces with equipment, training and intelligence. The aid has cost the US than $7 billion, according to WOLA (Washington Office on Latin America), a Washington, D.C. human rights organization. What is not well-known is that Colombia is no longer merely a recipient of US help. The relationship has evolved to the point that Colombian soldiers directly embed in the US command structure, helping construct a multinational military force, and serve as proxy for US troops worldwide. Colombia is now a “net exporter of security,” US Navy Adm. Kurt W. Tidd told a Congressional hearing earlier this year. Tidd heads the Pentagon’s Southern Command (SouthCom), which from its base in Florida oversees all US military operations in Central and South America and the Caribbean. Colombia has become an active component of US global security strategy. According to Southern Command, it has served as proxy for US forces in more than 60 countries globally, where Colombian soldiers train local militaries at less cost and less political exposure than would exist with the direct use of US forces. This coming-of-age by the Colombian military raises an obvious question. If they’re so good, why can’t they restore security in the country’s rural regions and stop the mass assassinations of community leaders? The answer to that lies in the political arena, but from a purely military point of view, there is no doubt that Colombia has reached a very high level of competence. 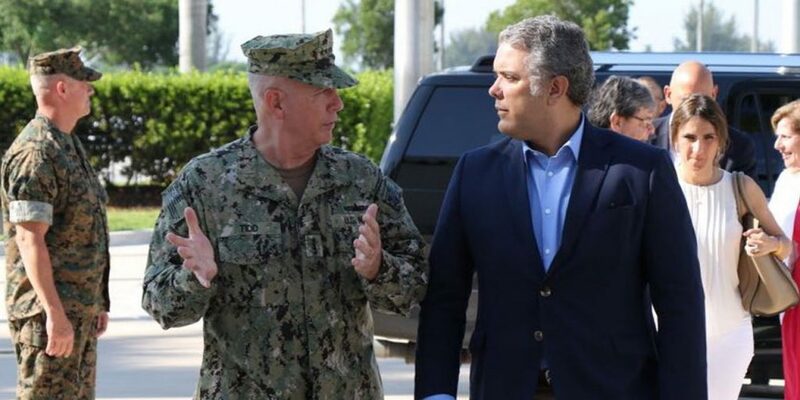 In one recent development, the US Marine Corps is using a Colombian naval Infantry officer as the key figure in assembling what SouthCom calls a “multinational amphibious task force” to operate in waters and coastal areas throughout the Western Hemisphere. The Colombian is Lt. Col. Erick Del Rio, the first foreigner to literally embed as a senior staff officer of Southern Command. His appointment earlier this year was the first step in “taking the vision of a multinational task force from concept to reality,” as a SouthCom news release put it. This “”multinational amphibious task force” illustrates both the potential benefits and drawbacks of the growing integration of Latin militaries with the US. On the one hand, such a multi-national force could be more effective in disaster relief and drug interdiction than a single-nation effort. And the US could use it to nudge Latin American militaries toward professionalism and away from politics. On the other hand, it could also be a way the US could accomplish regime change or some other political objective in a South or Central American country. For example, no single country might willingly go alone in a military intervention. But a multi-Latin force with US participation might be politically palatable. With President Donald Trump’s appointment of John Bolton—the leader among US strategic hawks—as National Security Advisor, Washington’s possible use of such tactics is not so far-fetched. The Colombian military’s world-class status and emergence as an operational partner of the US has been chronicled by SouthCom in many ways. In July this year, during an air-to-air combat training exercise in Nevada, a Colombian Air Force aerial tanker for the first time refueled a US jet mid-air. In May, Colombia became a member of NATO (North Atlantic Treaty Organization), the first Latin country to do so, though its Pacific and Caribbean coasts are far from the North Atlantic. In April, a Colombian submarine for the first time joined with the US Navy in anti-submarine exercises off the coast of South America. In July, a Colombian team won the Fuerzas Comando (Commando Forces) competition among elite special forces from 17 Western Hemisphere nations. Colombia’s team beat out the US squad and won for the ninth time in 14 competitions. In June, its troops were among those caught off guard when Trump abruptly cancelled South Korean military exercises. It would have been the country’s fifth participation in the Far Eastern war games. Last fall, Colombia coordinated a multi-nation parachute drop in Washington State, using Colombian Air Force planes. Colombia’s partnership with the South Carolina National Guard has involved live-fire artillery drills in the US and aerial maneuvers with US F-16s over Colombia. Colombia has long been the US’ strongest and most reliable Latin military ally, a consequence of the two-decade long Plan Colombia in which the US used the cocaine trade and the FARC rebellion as justification to strengthen the Colombian military. But Colombia’s security forces are now capable of doing far more than fight drug-runners and rebels. Topics have included “maritime interdiction, jungle combat, antiterrorism intelligence and tactics to fight extortion, kidnapping and drug trafficking,” according to the London-based Financial Times. Colombia does more than just train. In Yemen, hundreds of its war veterans were hired by the United Arab Emirates as mercenaries to fight against Iran-backed forces. Emirati officials hired them because they are “battle tested in guerrilla warfare, having spent decades battling gunmen of the Revolutionary Armed Forces of Colombia, or FARC,” reported the New York Times. Colombia is also an increasingly active supplier in the global arms market, having manufactured handguns for Paraguay, Chile, Peru and Ecuador; military and police boats for Brazil, South Korea and Honduras; and parts for Israeli-made rifles, according to Diálogo, a SouthCom publication, and the Financial Times. Colombia’s economy is as fully militarized as the US’. Both countries spent 3.1% of their GDP on the military in 2017, far more than any other nation in the Americas, according to the Stockholm International Peace Research Institute. 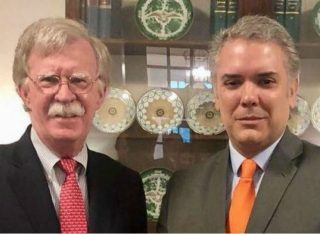 Bolton cited an increasing Latin American presence by China, Russia, Iran and Hezbollah in support of the view that “we need greater involvement” in that region. From the last years of the Bill Clinton administration and continuing uninterrupted into the Trump administration, the US has invested heavily in Colombia’s security forces. That $7 billion has failed to curtail coca production. But as the US uses Colombia’s military around the globe, it is reaping a different kind of return on that investment.